No wonder that Amsterdam is flat : it has been fully built on piles, from houses to parking lots including the subway. 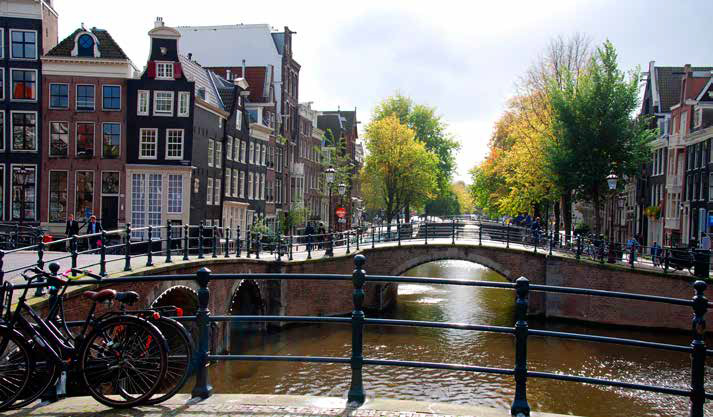 Water is everywhere, with more than 10 kilometers of canals and multiple bridges linking the 70 islands in the city. On the canal sides, the former warehouses as well as the chic houses from the rich merchants of the 17th Century, reflect their image in the water, creating a surprising mosaic of facades. In this area of the city, it seems that time stopped, while on the east side of Central Station, in the former harbour, the city has gone through major changes and integrates ultimate modern architecture. Most of the 8.000 monuments and most museums of the city are all located within a short distance of each other. The museumboot is an efficient and pleasant means of transportation for the visitors to explore the city.